In this post, we will see another mathematics problem-solution book titled Problems in Elementary Mathematics for Home Study by N. Antonov, M. Vygodsky, V. Nikitin, A. Sankin. 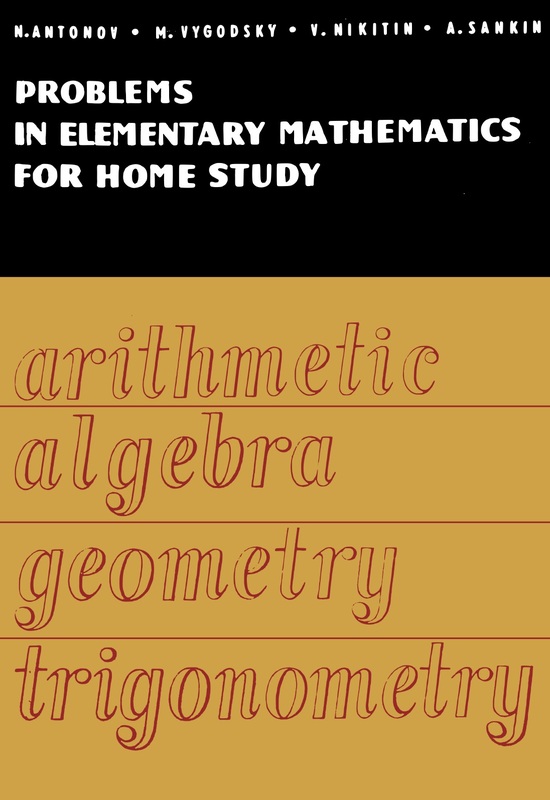 A collection of 928 problems in arithmetic, algebra, geometry and trigonometry (with answers) prepared for home study by correspondence students and others studying or brushing supplementary mathematics without a teacher. Problems with similar solutions are grouped together with a detailed example of the solution of the first problem in the group. Will be found a useful resource of questions for revision, tests, and examination papers. Has had 17 large editions in Russian. The book was translated from the Russian by Leonid Levant and was published by Mir Publishers in 1982. Scan by original uploader in DJVU format. We bookmarked, added covers and converted to PDF. This entry was posted in books, mathematics, mir books, mir publishers, problem books. Bookmark the permalink. Reblogged this on Yassin Balja.